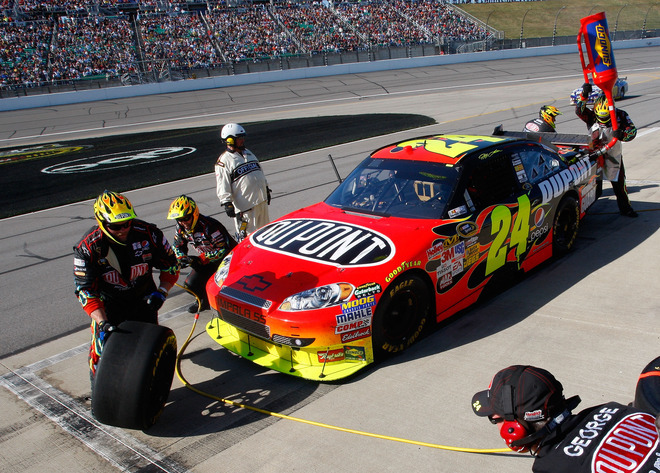 October 4 – – Jeff Gordon finished 2nd in the Price Chopper 400 at Kansas Speedway after a late race four-tire change allowed him to move through traffic. 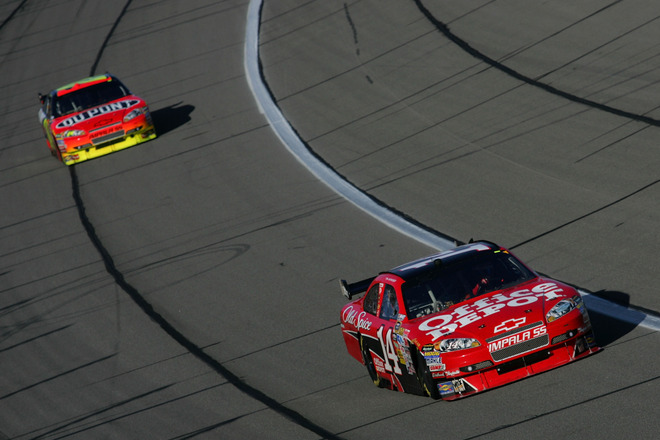 He struggled with handling at the outset, but made up positions in the last 30 laps. 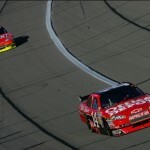 However, he was about a half second behind race winner Tony Stewart at the finish. “We were better than Tony at the end but not enough,” Gordon said. “We needed to get out front sooner to maintain it. 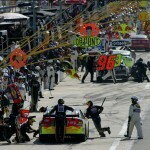 As I got closer to Tony, my car got tighter.” He moved to 7th in points, and trails by 103 in the standings. It’s a short week for Gordon as he’ll jet to California for several mid-week appearances. THE MODERATOR: We are pleased now to be joined by today’s second place finisher. 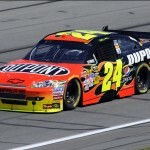 He moves up to seventh in the point standings in the Chase, and that’s Jeff Gordon. He drives the No. 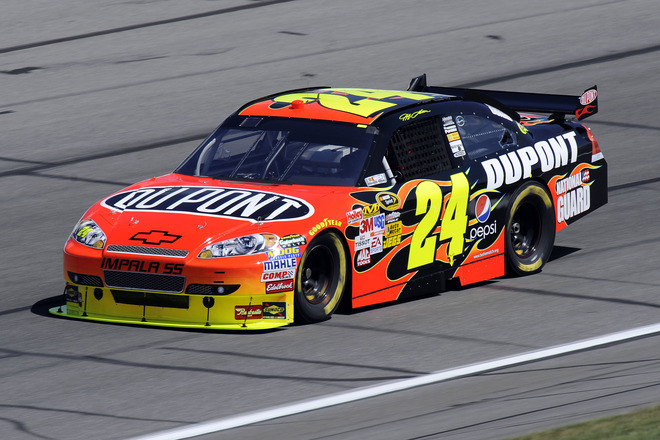 24 DuPont Chevrolet. 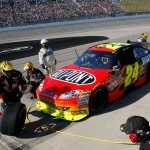 JEFF GORDON: That’s it? Can’t you read it different? Just tell me I’m fifth. 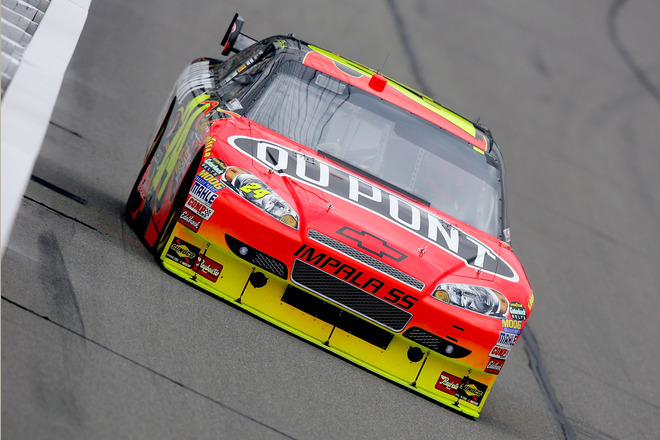 THE MODERATOR: Seventh in points, drives the 24 DuPont Chevrolet, but certainly a strong one out there this afternoon for your race team. 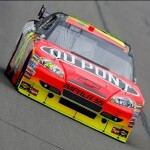 JEFF GORDON: Yeah, it was definitely a strong finish. We really struggled at the beginning of this race. I was pretty disappointed that the car was doing the things that it did. I’m really, really proud of this team and Steve for not giving up. I mean, I was a bear on the radio because I was so mad about it. And we just never gave up on it. We kept tuning on it, and Steve made some great adjustments and we had great pit stops and found ourselves in position there at the end with some guys and two tires to take advantage of it. To come back and finish second is certainly a great, great day for us. is always right there, first, second, third, fifth, and you seemed to be a little surprised that you had only gone up to seventh. Is it kind of annoying or frustrating when you do as well as you do and you don’t make up a lot of ground? 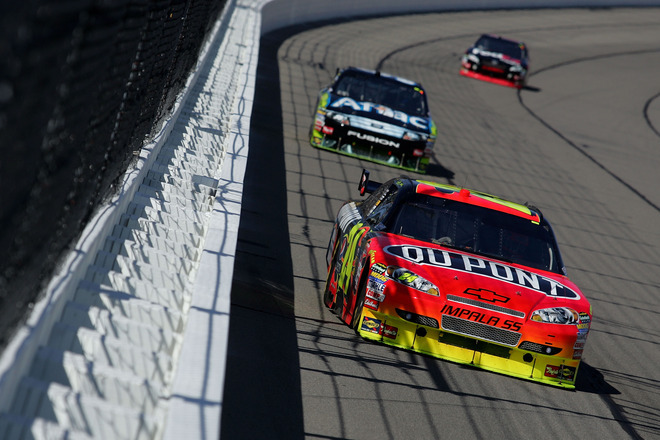 JEFF GORDON: I mean, a little bit, but you don’t expect to go from where we were in points all the way up to first. I mean, it’s just that you have a good today like today and you’re not really sure where everybody finished, and you’re kind of hoping for the best, that you made some big jumps. I mean, I’m pretty sure we made a big jump from a numbers standpoint, it’s just maybe we didn’t go up a lot in positions. But that’s what happens when you get off to the start that we did at New Hampshire, when you finish 15th and all the guys that you’re racing in the championship finish ahead of you. Then even a day like today is not going to necessarily turn you around and all of a sudden be in the top two or three. We’ve just got to keep doing this. That’s what I’m excited about. 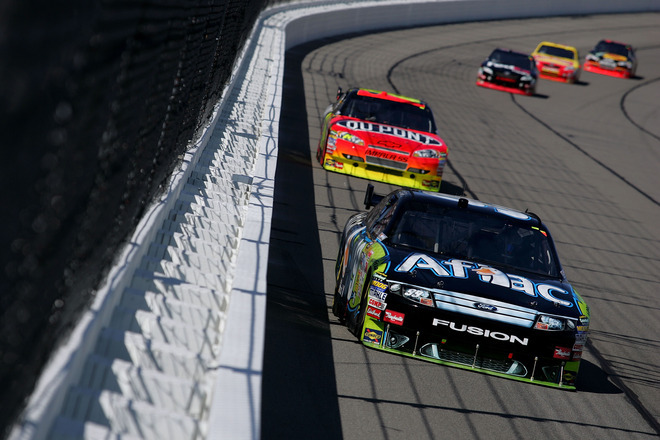 Keep having finishes like today and effort like today, and we’ve still got a lot of races left. Q: Just talk about chasing Tony and just what was going through your mind as you were round and round and round and just can’t get to him? 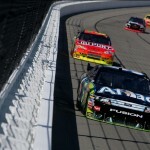 JEFF GORDON: When I got into third behind Greg, I knew we had a good car, and I was trying to put down the best laps that I could and started not really making any gains. Then I searched around a little bit and hit on a couple things and gained on Greg, and I was able to get by him a little bit quicker than I thought I was going to. And so at that point, I was like, ooh, maybe I do have a shot at Tony. As I got closer to him, my car just really started getting tighter and tighter and tighter, and at that point I tried searching around a little bit, but there just really wasn’t anything I could do. Tony was running a really solid line and had a good car. He had clean air. As long as he didn’t make any big mistakes, I wasn’t going to catch him. I got a little bit of hope there one time; he slipped coming off of 4 and I gained on him, but after that I couldn’t gain any more. Q: Jeff, with the fact that you guys finished six, seven spots ahead of the 5 and the 48, that brings you guys back up a little bit closer. How important is that to just kind of keep chipping away like that? You may not make great gains on them, but if you keep chipping away at them, you can be in a position to close the gap. 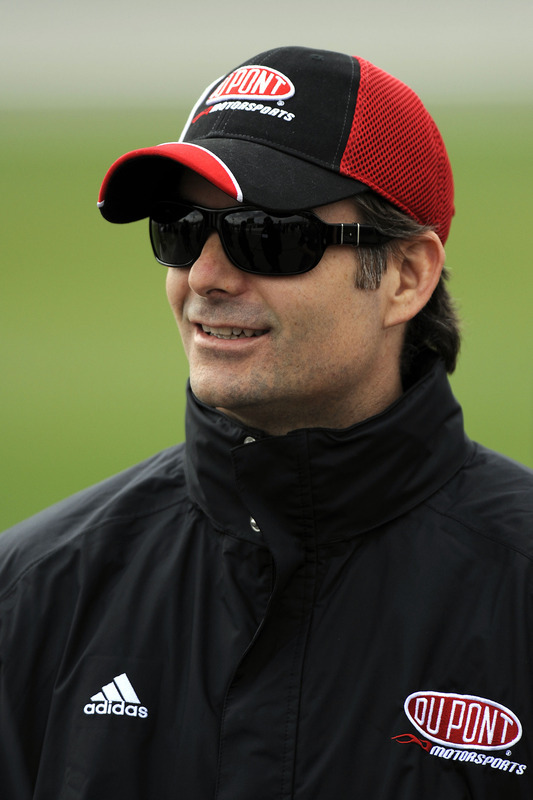 JEFF GORDON: If we can just do it in another seven weeks, man, I’ll be happy with that. Right now we’ve got to focus on our team and our program and our finishes, and we can’t control what those guys do, or Greg or Tony or any of them. We got a little bit behind in New Hampshire. 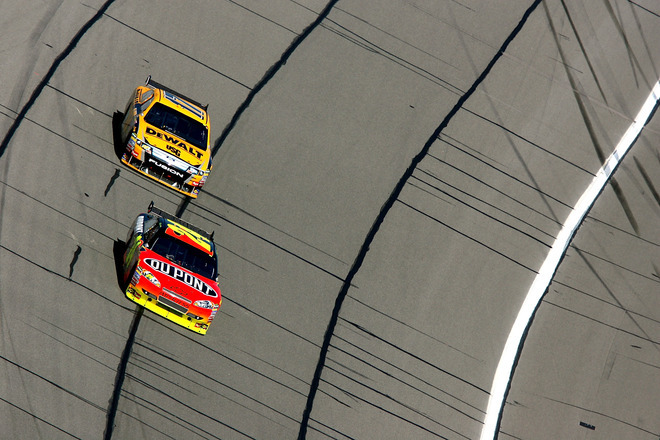 We’ve got to make sure that’s the worst finish that we have in the Chase. That’s the only chance that we have, and that’s asking a lot, but that’s now our goal. It’s the position we put ourselves in. Racetracks like today are good tracks for us, but I’ll tell you, when they dropped the green, I thought we were going to get lapped. We were really far off. I’m as optimistic and excited right now about the fact that we made adjustments and got ourselves to a second place finish as I am just that we had a good day. I mean, we’ve got a lot of work still left to do. Q: Over a 25 lap run like we had at a track like this, can you sort of describe the difference in the feel of the car with the two tires versus four? How does that work out? 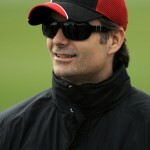 JEFF GORDON: It kind of goes in cycles. We took two earlier, and it actually worked pretty good for us until the end of the run. So I think that four tires are a little bit better right from the getgo for a couple laps, and then I think they seem to level off once they get up to temperature. And then once you get to the end of the run when the fuel load goes away, then it really starts to go. I mean, we were better than Tony there at the end, but not enough. 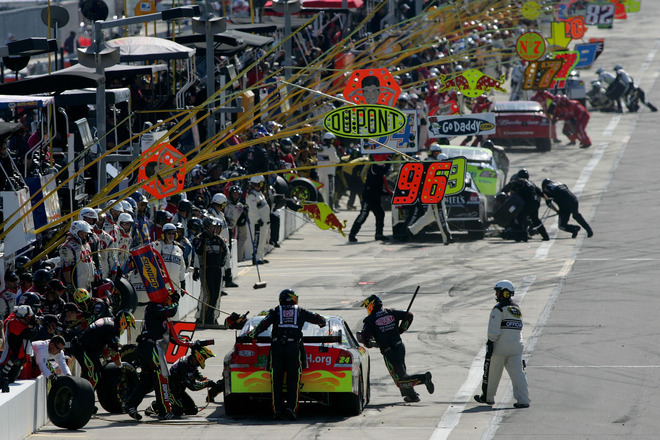 We made some adjustments to make our car good on the restart and tried to jump up through there, and it worked. It did what we needed it to do. But we needed to get out front sooner in order to maintain, and we didn’t. So that’s why we finished where we did. But going back to the two tire thing, it’s risk versus reward, and look at how it worked out for Tony but look how it worked out for the other guys. You’ve got to be willing to take that risk, if you’re not the first guy out there when they drop the green, what’s going to happen, because for a bunch of guys it didn’t work out. You’ve got to kind of weigh that out, and for us four tires was the way to go. But two tires earlier worked decent. If we had known we were going to get out front, then maybe it would have worked. But you don’t know that, and I’m not sure, you’ll have to ask Steve why he made the decision he did, but I’m glad he made the four tires call. Q: Jeff, you were talking about how finicky this car is. What is the cure for that? Do you try to figure this stuff out in practice? 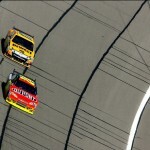 JEFF GORDON: I’m telling you, that first run I didn’t think any communication skills in the world was going to fix that thing. I didn’t think any adjustments I thought we were going to have to come down and change four spring shocks and sway bars. I don’t know how that car came to us, I really don’t. I definitely give Steve a lot of credit for not panicking. He made adjustments, but they weren’t just crazy adjustments. It does tell you how finicky this car is. We made some adjustments where the car came around a little bit, still wasn’t great, and it never really was spectacular all day. Even there at the end, I was good in 1 and 2 but not in 3 and 4. We’ve got to go back and analyze what we did throughout the weekend, where we started the race, what adjustments we made. I was so mad I didn’t pay attention to adjustments to be honest with you. I just told them what it did and drove the heck out of it, and somehow we finished second. I’m looking forward to going back and talking to them. I know what I did wrong. I know I made a mistake. But we’re sure excited to be running good again and especially going to some tracks we like, like California and some other places. I’m having the time of my life, I know that. 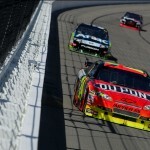 JEFF GORDON: I think that’s why they made the Chase. Right now Tony would be pretty much on cruise control with the championship. So they made the Chase to have a playoff type system, and all year long it’s been anybody that can win races and comes on strong, and now that’s what we’ve got. I think that it’s even though the Hendrick cars started off the first two races strong and we were strong today, that doesn’t mean that this thing is over. There’s a lot of racing left to go. There’s a lot of great competition, and the competition is as even as I’ve ever seen it. Even though we’ve had some dominating performances, to have so many different guys in the Chase running up front at different racetracks is impressive. THE MODERATOR: Thanks for putting on a great show. Good luck at California.